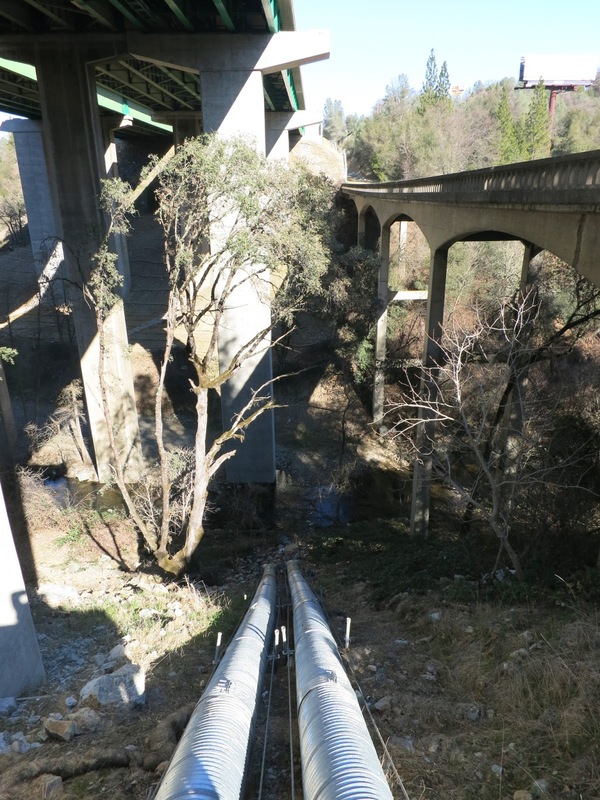 Over the next few days we are going to study several bridges that cross Weber Creek, a 12 mile long tributary of the South Fork of the American River that runs through Diamond Springs, California. Diamond Springs took part in much of the 19th century development that helped to create California. The wagon route used by the first pioneers went through town as well as the Pony Express and parts of the first Transcontinental Railroad. Today, two major routes go through Diamond Springs, State Route 49 and State Route 50. More information on the history of transportation through Diamond Springs can be found on Wikepedia. 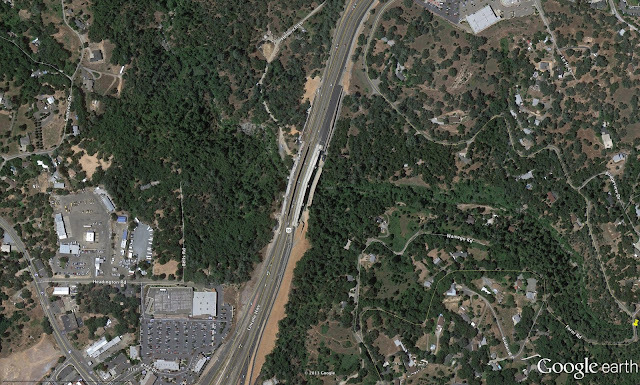 Today's bridge was the original State Route 50 crossing over Weber Creek, just half a mile west of the previously studied Forni Road Bridge (the yellow pushpin in the Google earth photo below). In 1963, parallel, steel girder, four span bridges on multicolumn bents were built beside it, but they left the original bridge (built in 1938) in place. State Route 50 keeps getting more and more traffic as El Dorado County continues to grow and so new lanes are being built, but so far the original bridge has been preserved. El Dorado County, California's Bridges: State Route 50 across Weber Creek (1) by Mark Yashinsky is licensed under a Creative Commons Attribution-NonCommercial-ShareAlike 3.0 United States License.